L-DOPA remains the most effective therapy in the management of the motor symptoms of Parkinson’s disease (PD). However, chronic treatment with levodopa is associated with the risk of development of motor fluctuations such as choreic and dystonic abnormal and involuntary movements affecting mainly the upper body, face and extremities. These disabling side effects are called abnormal involuntary movements (AIMs) or L-DOPA-induced dyskinesias. 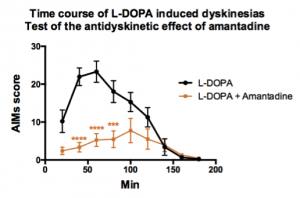 Given that L-DOPA is still a necessity in the treatment of advanced PD, reducing or avoiding dyskinesias is a key therapeutic strategy in the management of PD motor symptoms. These AIMs are induced in our rat model of PD (unilateral 6-OHDA lesion) after a chronic administration of L-DOPA during several weeks. 3 types of AIMs are scored: orolingual, limb and axial during several hours and each AIM are scored separately. Until now, a rating scale based only on the duration of each AIM was used. However the measurement of only the duration of behaviours was considered a limitation. A more expansive version of this scale was set up with the addition of amplitude parameter for each AIM improving sensitivity to the effects of our antidyskinetic reference compound, amantadine as well as a candidate compound. This new rating scale of AIM allows us to propose a more pertinent model to evaluate the antidyskinetic potential effect of candidate compounds.